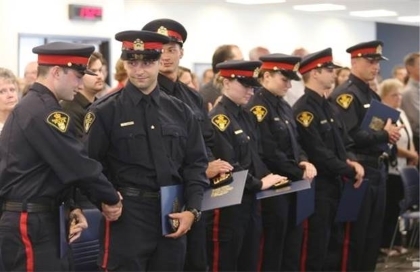 Applicants who meet our minimum requirements will undergo a multi-stage selection process to determine their suitability for our basic training program at the Saskatchewan Police College in Regina. The following steps are involved in the selection process to become a police officer. Applicants are welcome to attend information sessions which are held regularly at the Saskatoon Police Service. Applicants must register to write an entrance exam and psychological questionnaire by submitting the Testing Registration Form . The SIGMA is a 74 question general knowledge questionnaire and can be written free of charge. Sample exams (SIGMA) can be purchased from www.policeprep.com . After successfully completing the exam, applicants will be registered to take the physical abilities test. Applicants must pass the Peace Officers Physical Abilities Test (POPAT). The POPAT is conducted at the University of Saskatchewan, College of Kinesiology. Applicants must register with Recruiting by submitting the Testing Registration Form . The cost to take the test is $50.00, cash only. Please print the POPAT Waiver Information and have it signed by your family physician before you participate in the physical test. For further information on the POPAT Course and to view the course layout, please click here. An 8 week POPAT Preparation Program is available. For details contact Jason Weber at 306-966-1006 or e-mail him at jason.weber@usask.ca. Upon successful completion of both of the tests, complete and submit the Constable Information, Application and Personal Disclosure Forms . Applications will be reviewed and selected candidates will participate in a pre-employment interview. This detailed interview will include questions on each applicant's understanding of policing and why he or she has chosen policing as a career. This is an employment interview conducted by a Sergeant trained and certified in the use of a polygraph instrument. Applicants participate in a psychological interview. Complete and submit the second part of the application package including the vision form. Background checks are completed by a recruiting unit investigator. References are contacted to determine if an applicant's personal history, traits and characteristics are suitable for a career in policing. People contacted for these interviews include present and past employers and colleagues, family members, long-time friends, neighbors and landlords. Selected candidates will participate in final panel interview with executive recruiting and human resource personnel. Applicants who successfully complete all stages of the selection process are offered employment, subject to a successful medical examination. Successful candidates will be sworn in at a ceremony in Saskatoon. The recruits attend the Saskatchewan Police College in Regina for an 20 week Basic Training program. Upon successful completion, recruits will train with an experienced officer for a period of six months.